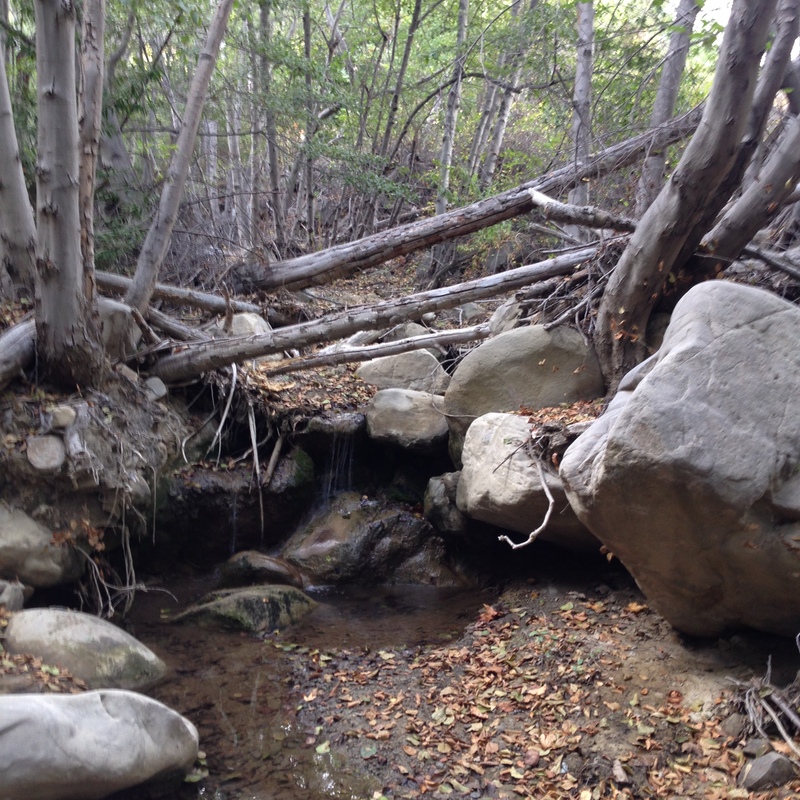 Distance: about 12 miles round trip to Upper Matilija Creek Campground. Difficulty: Easy however the short switchback from Middle Matilija Creek to Upper Matilija Creek is not very well maintained. I would avoid this area during the rainy season as the integrity of the trail is questionable and looks prone to landslides. Permits: Permits are not required for this trail, however we used an Adventure Pass to park at the trail head. 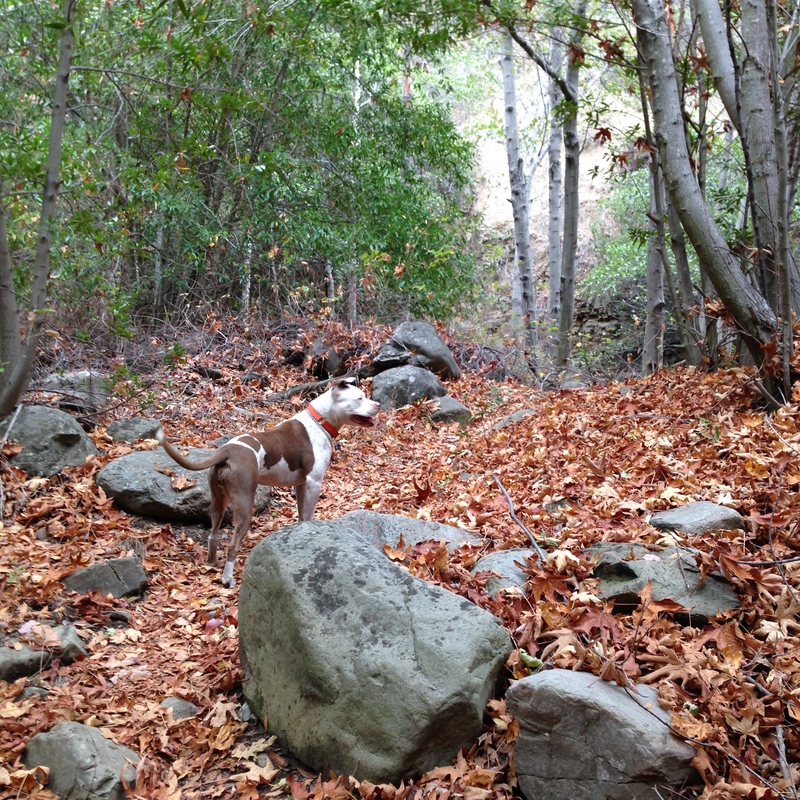 Dogs Allowed: Dogs are allowed within Los Padres National Forest. This summer has been an exceptionally warm one in Southern California. With the weather still in the high 90s, we were hoping to catch another backpacking trip to the Eastern Sierras before winter hit. We planned a trip with our group of friends to Cottonwood Lakes inside the John Muir Wilderness area but decided to cancel the day before due to thunderstorm warnings. 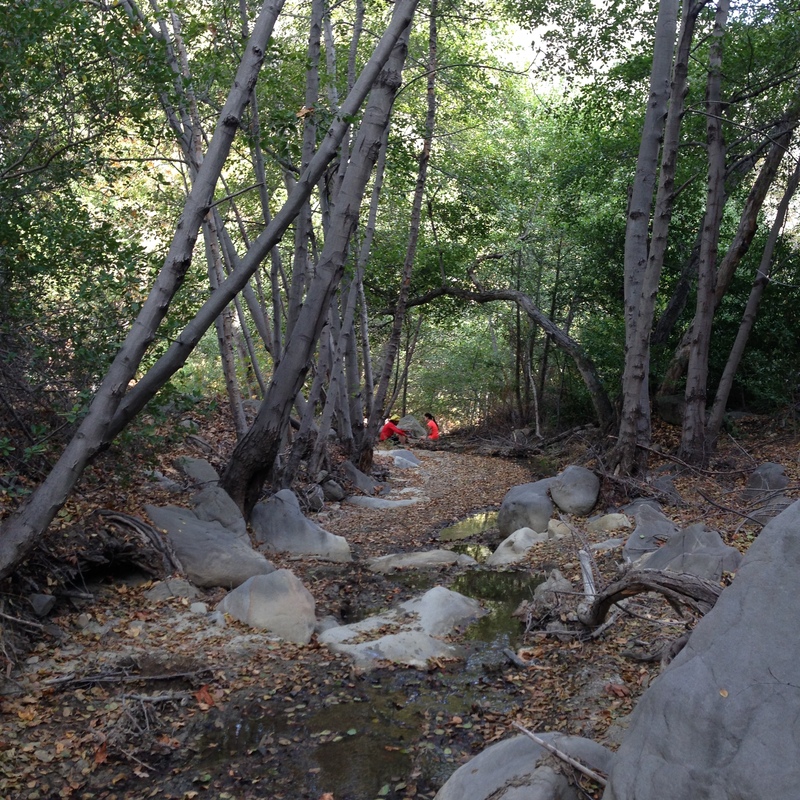 As a backup, the group decided to check out Matilija Creek trail because it is one of the few places in Southern California where there is still a reliable water source. Located 30 minutes north of Ojai, California, inside Los Padres National Forest, it took us 2.5 hours to get to the trail head from South Orange County Saturday morning. Matilija Creek trail head has had a long history of land disputes between the landowner and the national forest service. There is a recent lawsuit filed to officially keep the trail open. Legally, there is a public easement over the land in question. 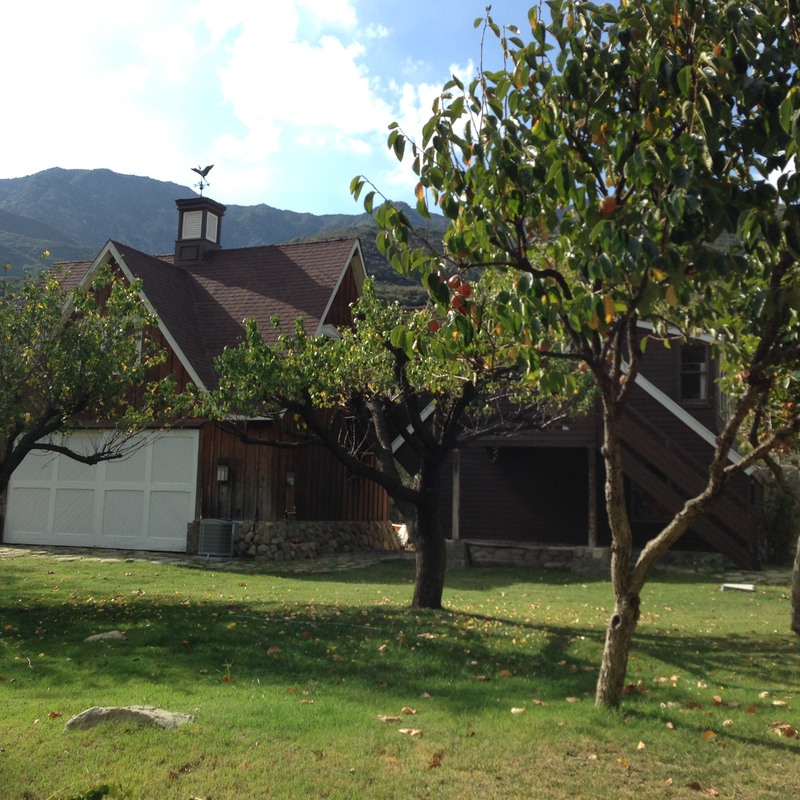 I called the Ojai forest service ranger’s office to inquire about the land dispute the day before our departure and received confirmation from the ranger to park at the Matilija Creek trail head. 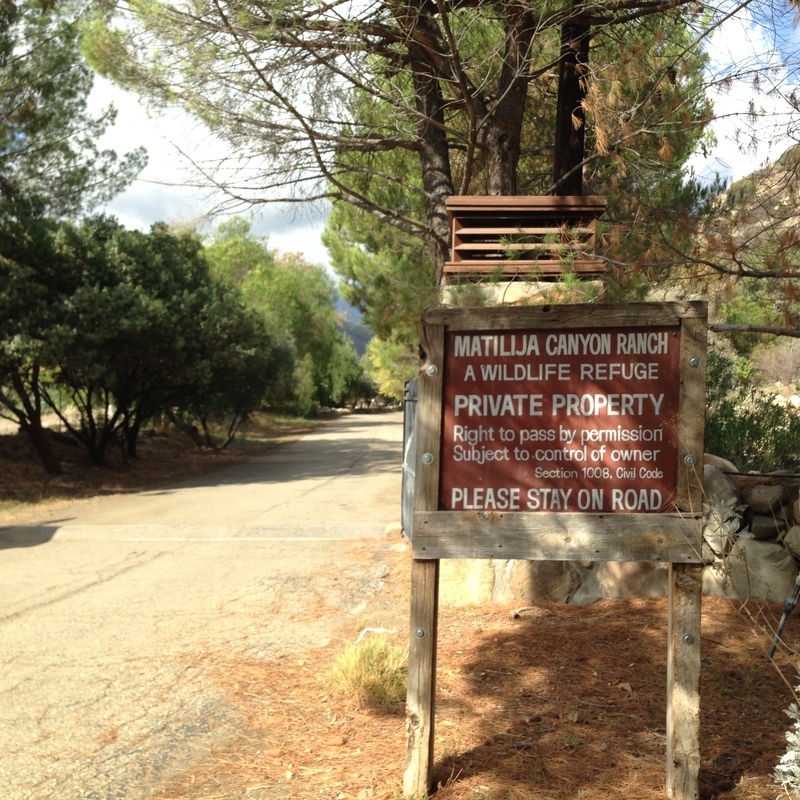 The trail head is located at the end of Matilija Road with signs clearly indicating private property at the beginning of the trail. We started our hike around mid morning, the weather was in the high 70s with sunny skies. The trail is about 50% shaded making it a very pleasant hike. 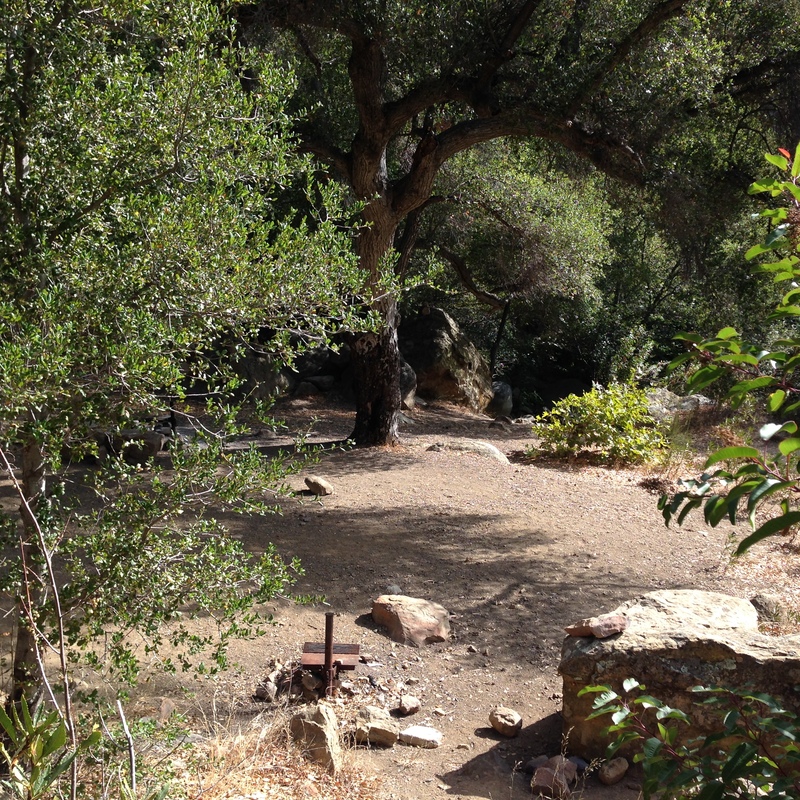 Be sure to keep an eye on the signs and your map at the beginning of the hike as there is an early turn that takes you to the Matilija Creek campsites. Make a right turn after a quarter of a mile from the main entrance and follow the signs to Upper Matilja Creek. We hit the first Matilija Creek camp at the 1 mile mark and it seemed like a very well established campsite with fire pits and benches. Even though there was a constant flow of water every 1-2 miles, it was easy to see the area is much dryer than usual with some of the creeks completely dried up. 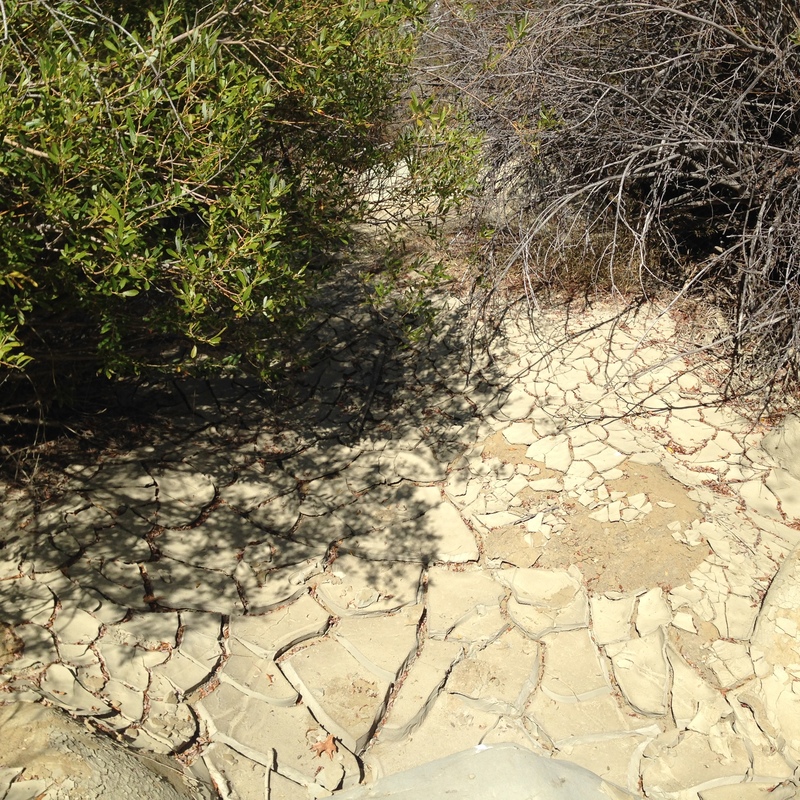 We passed by several dried up creek beds that looked liked it used to be year-round water sources. We reached Middle Matilija campground a little after lunch at the 4 mile point and discovered the campsites were already taken by a Boy Scout troop from Oxnard. 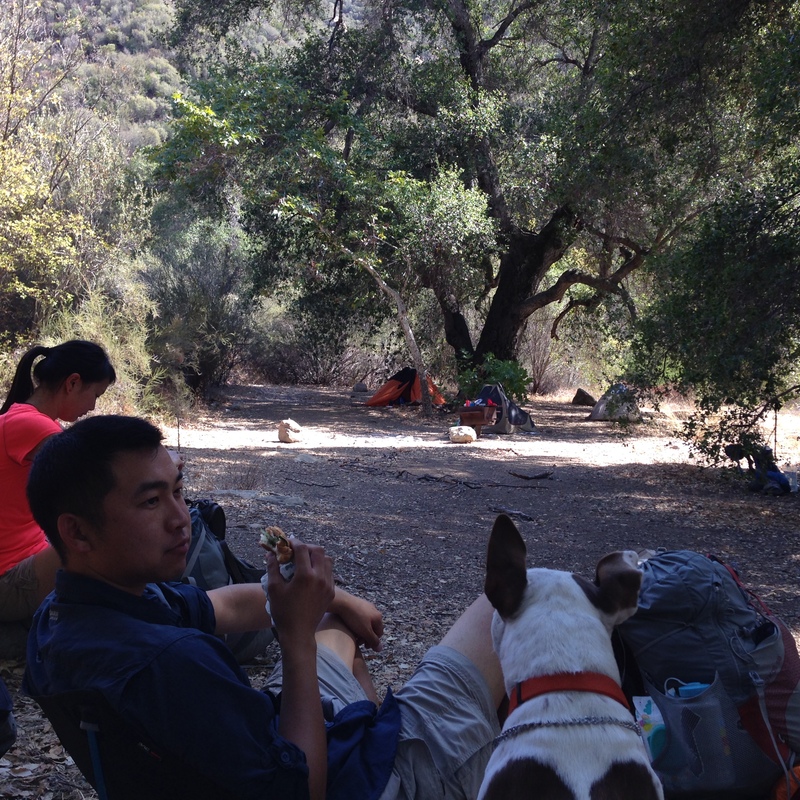 After a quick hello and lunch break, our group decided to move forward to the Upper Matilija campground. Middle Matilija campground and Dakota patiently waiting for her portion of Louis’s subway sandwich. 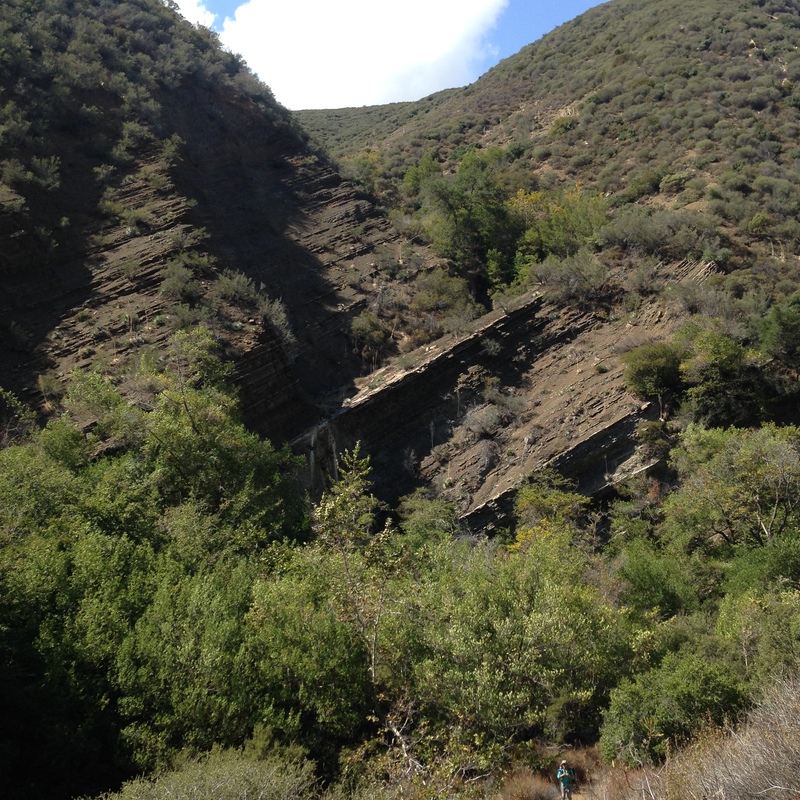 There is a little bit of a switchback after Middle Matilija campground. The elevation gain isn’t too bad, however, the trail became very exposed during the climb. The trail along the switchbacks were not very well maintained at this point. I would avoid this area during the raining season to avoid potential landslides. The trail gets pretty overgrown at about half a mile from the upper Mailija Creek but is still easy to navigate thanks to all the well placed cairns. 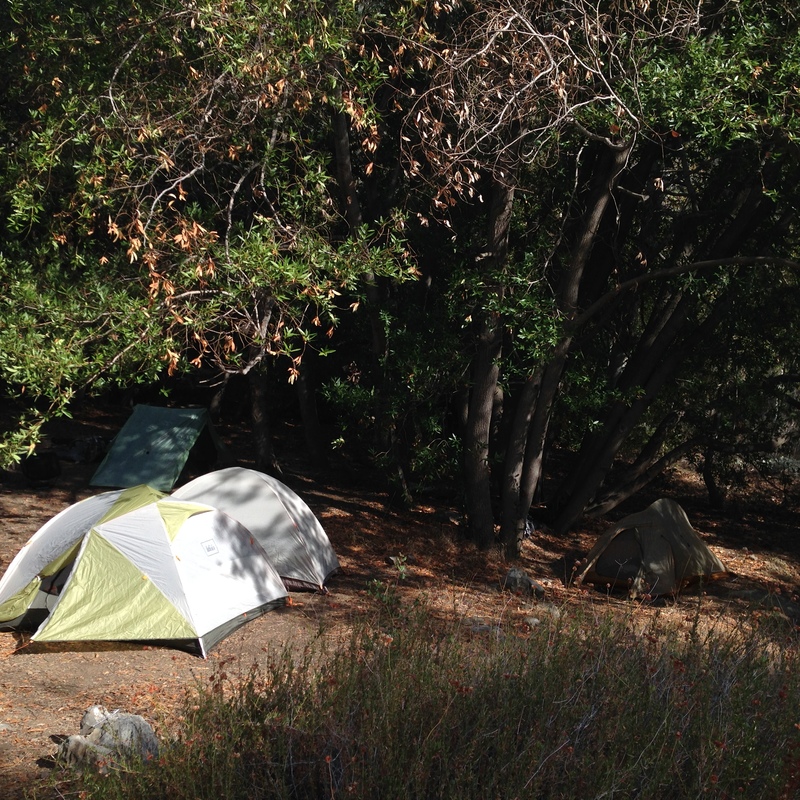 The Upper Matilija campsite is a decent size for our group of 8 people. With a little bit of planning, we were able to fit 4 tents in the cleared out area. While we were hoping to find some nice swimming holes next to the campsite, the creek was flowing too slowly for a swim. Luckily, there was still enough water for us to filter and clean ourselves. Overall, we enjoyed this trail and would visit again. It is a good last minute trip as permits are not required. This entry was posted in Hiking & Backpacking, Trail Reports and tagged adventure, backpacking, camping, Hiking, outdoors by hikenoworklater. Bookmark the permalink.